Opening up in an area of Mount Baker that’s been fairly bereft of restaurant and bar options, Heyday is already pulling in loads of local families and neighbors, thanks to its sunshiny combination of decor (the new building has a comfortable mid-century modern feel, with a teal- and gray-tiled bar, cool slatted wood on the walls, concrete floors, hip cardboard lamps and big windows), food (gourmet burgers and snacks) and a friendly attitude. Opened by Gary Snyder, owner of Geraldine’s Counter in Columbia City, and one of his longtime customers, Dang Nguyen, Heyday also boasts a team of Seattle restaurant vets who will run the joint. But it’s their tight cocktail selection that caught my eye. The drinks: Deb Jones (formerly of Matt’s in the Market, The Tin Table, Terra Plata) is running the bar. The drinks here include a list of six seasonally rotating cocktails, and a small but solid selection of beers and ciders (on draft and in bottles) and wines. 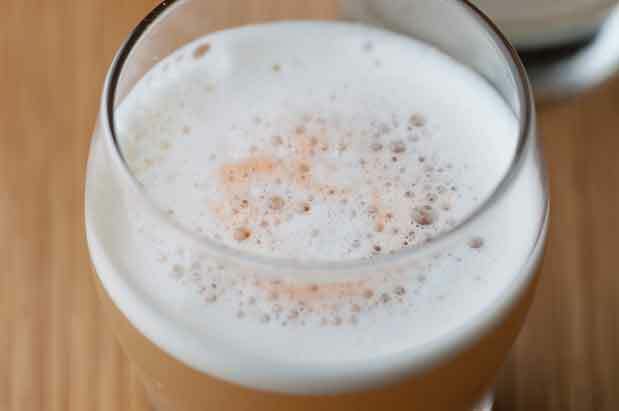 When I was last there, my top tipple was the Maple Bourbon Sour ($10), a rich, frothy number with a convivial kick, thanks to its combination of bourbon, lemon, maple syrup and egg white. The Cool Ride ($12) was also a hit at the table, with its bright gin taste augmented by a simple mix of St-Germain elderflower liqueur, lime, cucumber and mint. The food: Melissa Nyffeler (of the sadly defunct Dinette) crafts the menu of better bar food: burgers, salads, snacks and sides. While the blackened cauliflower starter ($8), with roasted peppers, onions and fried almonds, was a treat, don’t fill up too early, because the big burgers, served on fluffy Macrina potato buns, are the real stars. It’s hard to choose, but two faves were the adventuresome Saigon ($11), with a beef, pork and shrimp patty topped with cabbage, mint, cilantro, pickled daikon, carrots and a Sriracha aioli; and the Bison ($14), with its toppers of Beecher’s sharp cheddar, grilled apple, radicchio, red onion, maple syrup and mustard seed sauce. Insider’s tip: Don’t get so stuffed you miss the adult Coleman caramel shake ($11), with vanilla ice cream, bourbon, walnut liqueur and salted caramel sauce. Because it always comes back to the cocktails. Opening up in an area of Mount Baker that’s been fairly bereft of restaurant and bar options, Heyday is already pulling in loads of local families and neighbors, thanks to its sunshiny combination of decor (the new building has a comfortable mid-century modern feel, with a teal- and gray-tiled bar, cool slatted wood on the walls, concrete floors, hip cardboard lamps and big windows), food (gourmet burgers and snacks) and a friendly attitude. Opened by Gary Snyder, owner of Geraldine’s Counter in Columbia City, and one of his longtime customers, Dang Nguyen, Heyday also boasts a team of Seattle restaurant vets who will run the joint. But it’s their tight cocktail selection that caught my eye.